If gear heads had any doubts about how ferocious electric sports cars can be, Richard Hammond destroyed them in June, along with a million-dollar prototype and some Swiss shrubbery. The former “Top Gear” host was shooting an episode of the Amazon series “The Grand Tour” in Switzerland when he overcooked a corner and went over the edge in an all-electric, 1,224-hp Rimac Concept_One. The car, one of eight in the world, sailed 100 feet before impacting and violently tumbling to pieces. Mr. Hammond, who escaped serious injury in the accident, was extricated before the car burned to a lithium-ion cinder. OK, so flammability might still be an issue. In an interview after the accident, Hammond said he has struggled to describe the physical intensity of futuristic whips like the Rimac, a car with four advanced motors, all-wheel drive and liquid-cooled lightning: A battery capable of instantaneously discharging a full megawatt of power. “We need a new vocabulary,” Hammond said. Car enthusiasts were left similarly speechless in May, when an all-electric supercar called the NIO EP9 knocked 6 seconds (6:45) off Lamborghini’s production-car record at Germany’s 12.9-mile Nürburgring test track, a universally recognized standard of performance. While a McLaren P1 LM (gas-electric hybrid) was able to nip the NIO’s record two weeks later, it’s clear that, between EV and gas, it’s on like Donkey Kong for the Nürburgring record. But wait, you say, aren’t EVs (electric cars) weird-looking, pokey and riddled with range anxiety? You are thinking of the Nissan Leaf. The first mass-produced EV of the modern era, released in 2010, did for EVs’ sexiness what VW has done for diesel. The electron burners you will meet here are a whole different species. If your ankles are tingling, it’s because you are on the shore looking at a tidal wave of electric vehicles. In July, Tesla CEO Elon Musk handed over the key fobs to the first few Tesla Model 3s, the American company’s EV for the people (people with at least $35,000 and the patience to wait months to get their car). Tesla has about a half-million reservations for the Model 3 in hand and plans to ramp up production to 10,000 cars a week by the end of 2018. Deliveries anywhere near those figures would make it the best-selling car in America. In September, the second-generation Nissan Leaf will debut (spy shots show a massive upgrade in aesthetics). With sales of more than 250,000 world-wide, the Leaf is already the most numerous EV in the world. This lurch toward electrification in the world’s largest car market implies transformational economies of scale. Example: As part of its campaign for redemption, VW Group has announced plans for 30 new EV models by 2025, with global sales targeting 3 million units, mostly in China. But having been more or less obliged to build such cars, auto makers still face the challenge of making them desirable and status-bearing. It’s comforting somehow that this part of the auto industry, at least, has not changed: You have to sell the sizzle with the steak. Porsche’s all-electric halo car, currently named Mission E, is scheduled for full production by 2019. Long dismissive of the very idea, Porsche executives have done an about-face on electric propulsion. In June, CEO Oliver Blume said that by 2023 half of the legendary performance brand’s production would be electric. With its 800-volt charging technology, the Mission E is targeting more than 300 miles of range and a 15-minute quick-charge good for 250 miles. Also: 600 hp, all-wheel drive, and 0-60 mph in 3.5 seconds, if that does anything for you. In 2019 Aston Martin will begin delivery of the RapidE, a version of the Rapide super-sedan with EV tech developed with F1 masters Williams Advanced Engineering. If you are wondering how eco-weenie mobiles got so mega, the simple answer is bigger, badder batteries and the systems that manage, support and cool them. The average specific-energy and power density of lithium-ion batteries has been rising steadily for the past decade. As they do, they allow more energy to be put in the bottle (to go farther) and widen the bottle’s mouth so more energy comes out at once (to go faster). Indeed, it was inevitable, given the nature of the mechanisms, that battery-packing sports cars would eclipse their piston-powered forebears in performance, at least over short distances. By virtue of a comparatively lower center of gravity, EVs tend to corner flatter and harder without body roll. EVs also put torque to the ground more efficiently. Unlike conventional traction-control systems, an e-motor’s twist can be modulated hundreds of times a second, exploiting all available adhesion between tire and surface without spinning. Most famously, electric cars enjoy a huge advantage in initial acceleration. This has been colorfully demonstrated about a million times on YouTube since 2012, when the Tesla Model S started handing out beatings to Camaros and Corvettes at drag strips. For driving enthusiasts there is also a little game-changer ahead called independent torque vectoring. By virtue of their compactness, EV motors can be arrayed at all four wheels, allowing each to work independently and cooperatively, speeding up or slowing down to help the car in extreme manoeuvring. As the driver heads for a corner, the inside front wheel slows, or even drags, the outside tire pushes harder, the rear wheels do the same, and the directional power actually bends the car’s path through the turn. While federal clean-air policy makers are rowing the other way, California has doubled down on its zero-emission-vehicle (ZEV) mandate, aiming to have 1.5 million such vehicles on the road by 2025 and obliging car makers to offer them. California is a must-have market for premium and luxury brands like BMW, Jaguar, Audi and Porsche. But if you really want to sell cars in America — or even California — you have to make a crossover SUV. And so, following in the ample tire tracks of the Tesla Model X, comes the finely curried Jaguar I-PACE, a five-seat, all-wheel-drive crossover with a 90-kWh battery, 220 miles of promised range and 400 electric horses (0-60 mph in about 4 seconds). Taking orders now for 2018 delivery. The I-PACE is no mere compliance car (an adaptation of a conventional product, built in small numbers only to satisfy the ZEV quota). Last month, the U.K. joined France and other EU states in announcing a ban on petrol-powered vehicles by 2040. The British government is positioning EV technology as a pillar of industrial strategy, post-Brexit. A similar urgency is pushing the German giants post-Dieselgate. 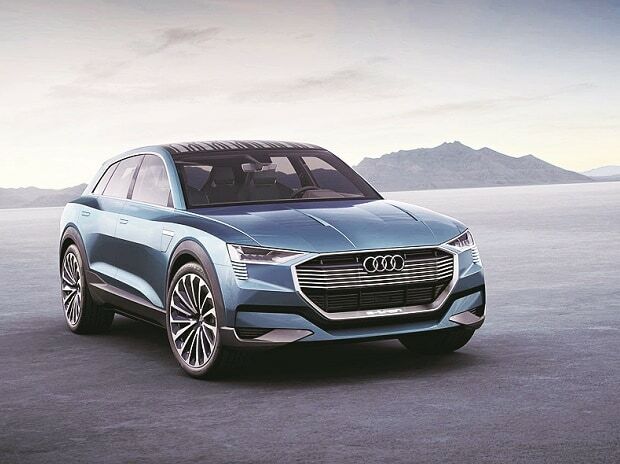 Jumping into the Model X’s pool is the 2018 Audi e-tron Quattro, a mid-size SUV with a 95-kWh battery, nominal range of 310 miles, and 0-60 mph in 4.6 seconds. Porsche has indicated it too will offer an EV crossover, Macan-sized, on the VW Group’s new dedicated architecture. Our Mr. Musk won’t be taking that lying down. Tesla has said it will have its own small-midsize crossover, called Model Y, before the end of the decade. Going down market a bit, Hyundai — already in the EV business with its Ioniq sedan—is expected to bring an all-electric Kona crossover to market in 2018. The subcompact ute will reportedly use a 50-kWh battery pack good for a 217-mile range with a starting price of $39,000. The one name we haven’t called is the Chevy Bolt, GM ’s excellent five-passenger EV that isn’t quite a crossover. With a range of 238 miles and price of $37,495 before tax credits, the Bolt seems to have all the goods, but so far it’s a soft-seller. What if the Bolt had been born a crossover, though? It could have been a star.